You are here: Home / HoloLens / How Was the HoloLens Demo Live Video Created? One of the overlooked things in the HoloLens on stage demo, during Microsoft’s Windows 10 event on Jan 21st is how the demo video was made live on stage. Lets watch the video again (8:46 ~ 9:26). The setup is this: While Lorraine is designing the quadcopter on HoloLens, there is a onstage camera beside her. This camera looks like a regular professional grade video camera, and generally speaking it only see Lorraine waving and moving fingers in the air. What Lorraine sees is the mix reality from her HoloLens. There is a big screen showing her live action: It shows a mixture of what Lorraine sees and the other camera sees. There is no surprise that two live video streams can merge with each other, interesting thing is: How the mixed reality is captured live, and How it is streamed to the big screen. 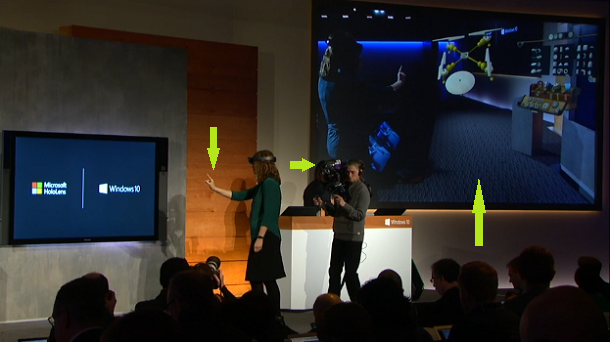 Lets say the HoloLens indeed captured the live stream of what Lorraine was seeing, it must be streamed wirelessly to the display beside, since we see no wires from her. This tells me that the HoloLens can stream live video wirelessly to a display device, or a PC. This is more of a confirmation than a new finding, we know HoloLens is a PC. But how does the mixed reality that Lorraine was seeing got captured on HoloLens? I dug in the Windows 10 tech preview build 9926 debug information, find out there is a name space called Windows::Mirage::Media::MixedRealityCapture. There are many function under it. Obviously, the mixed reality capturing is part of Windows 10 Holographic. The capture function may not be available to end users, but it will be there for developers. HoloLens: Where Is My Keyboard?